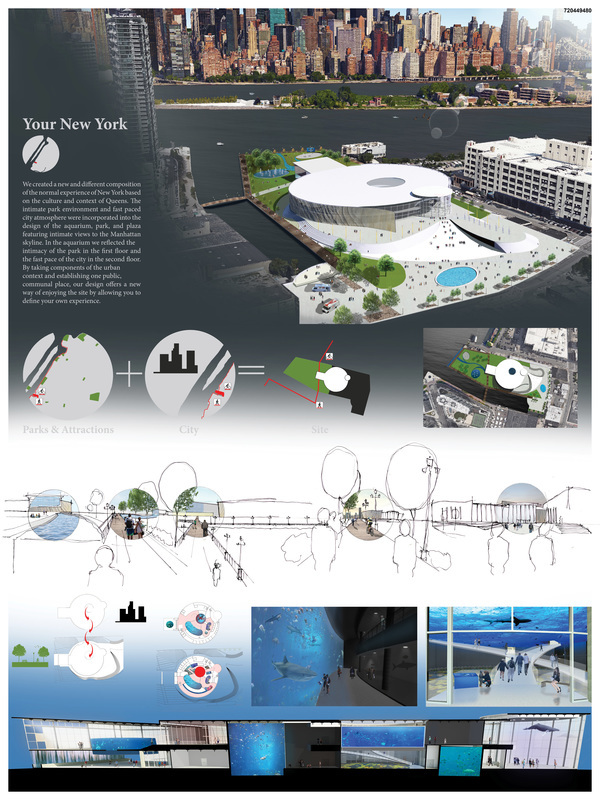 The location and program of NYC Water Drop Aquarium gives to Long Island ability of becoming one of the most attractive parts of the city and fulfill a need for symbolic and architectural feature that will provide diversity of cultural and touristic benefits which are going to embrace lives of citizens. Water Drop Aquarium creates landmark with its unique design and multiple functions. Diversity of exhibits, vibrant public spaces, ability of hosting performances, lectures, workshops creates an environment where passion, business and everyday life can come together, generating energy that will reverberate throughout an area which is already undergoing change. 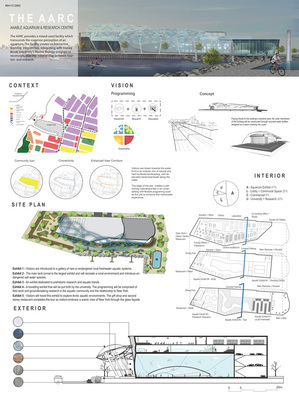 The design maintains this axis as the main entrance to the site from the East and proposes a new main access from the river on the West. In addition, the project wants to strengthen New York’s resilient development of the water edge continuing the riverfront promenade from Hunter’s Point South and connecting it to the site through a bridge on the south side. 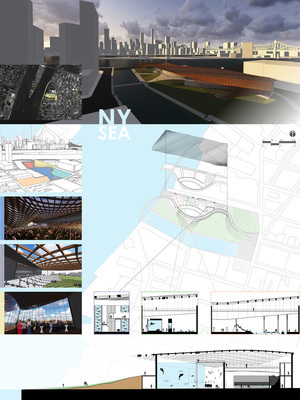 The new building develops along the north side of the project site while a soft topography and landscape grades down to the water on the south. As a defense strategy against flooding events, the north portion is elevated 4 feet from the ground while the south area features wetlands and a natural treatment of the water edge. 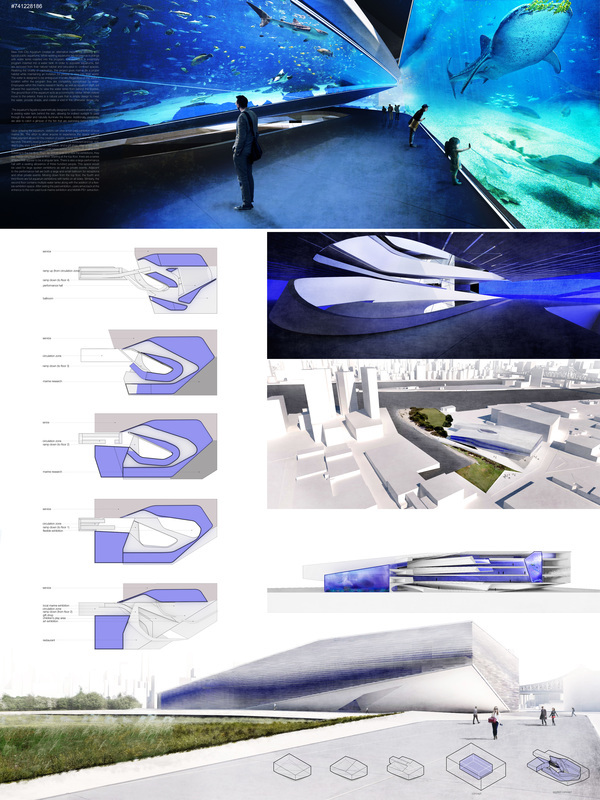 Dive in‘ is a concept for the whole project. Dive in an adventure and explore the Ocean, dive in education and learn about the global climate or just literally dive in a tank and discover it‘s inhabitants in an ‚Orb’. 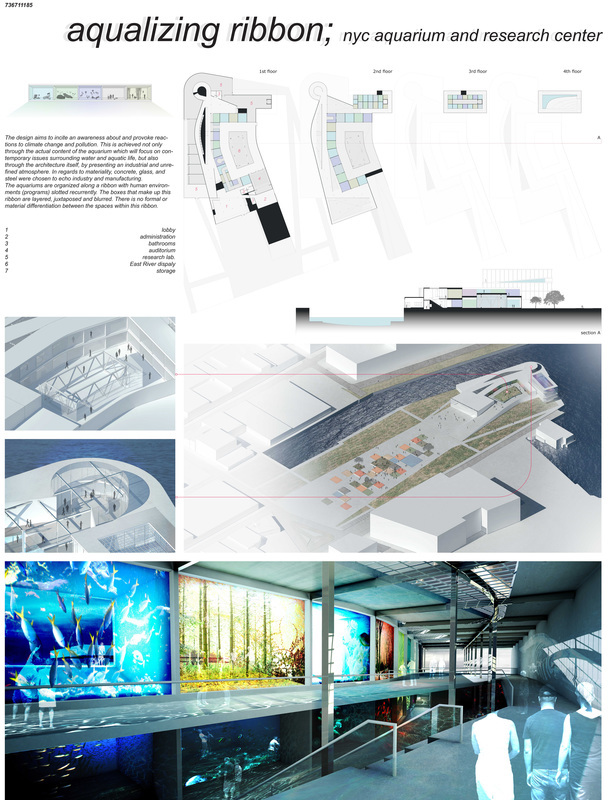 The concepts relates additionally on the thermohaline circulation (THC) which is crucial for the global climate and a welcome opportunity for the sea dwellers to travel from point a to point b. The surface and deep water currents provide two various sections. At the surface current section you learn everything about his way through the oceans, his biodiversity and the importance for the global climate. The following is a proposal to create building which function depends on the water level. 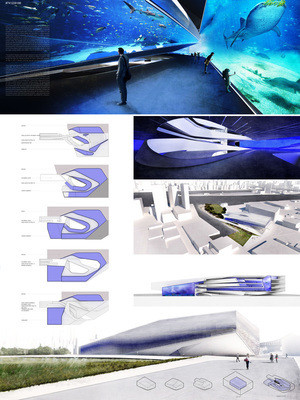 The base level of the aquarium is an independent structure which floats on the water surface. If the level of river rise up the underground level is going up and getting closed creating a watertight space. With a view to the close distance to the Central Park, whole site is arranged in way to recreate main paths of the complex. Instead of locking animals the exhibition is using interactive, 3d projections on fog located in special chambers to attract visitors without any harm to animals. 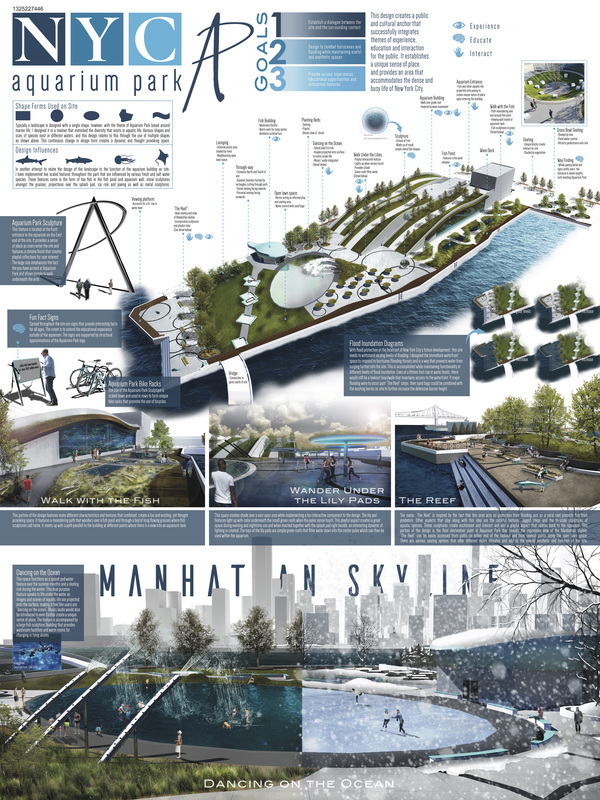 We created a new and different composition of the normal experience of New York based on the culture and context of Queens. 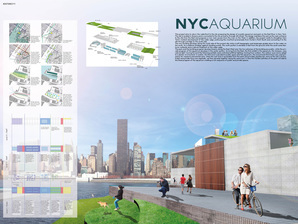 The intimate park environment and fast paced city atmosphere were incorporated into the design of the aquarium, park, and plaza featuring intimate views to the Manhattan skyline. 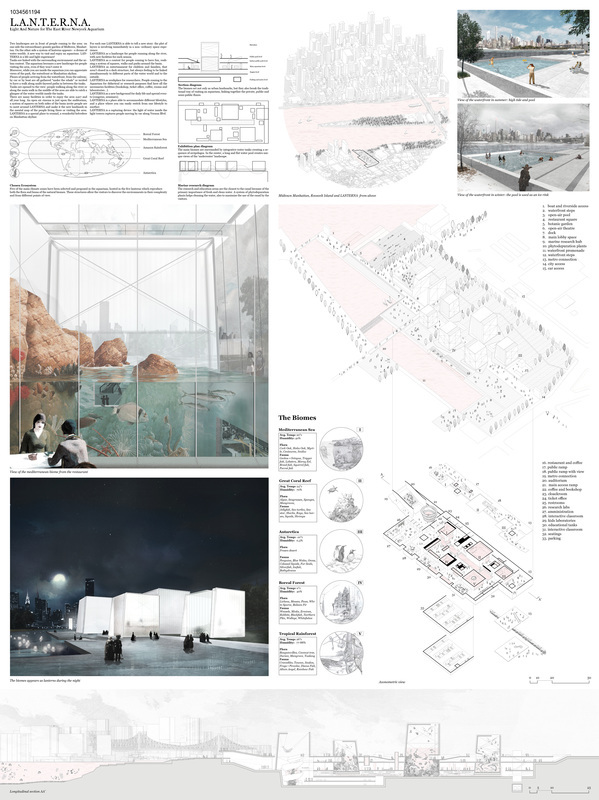 In the aquarium we reflected the intimacy of the park in the first floor and the fast pace of the city in the second floor. By taking components of the urban context and establishing one public, communal place, our design offers a new way of enjoying the site by allowing you to define your own experience. 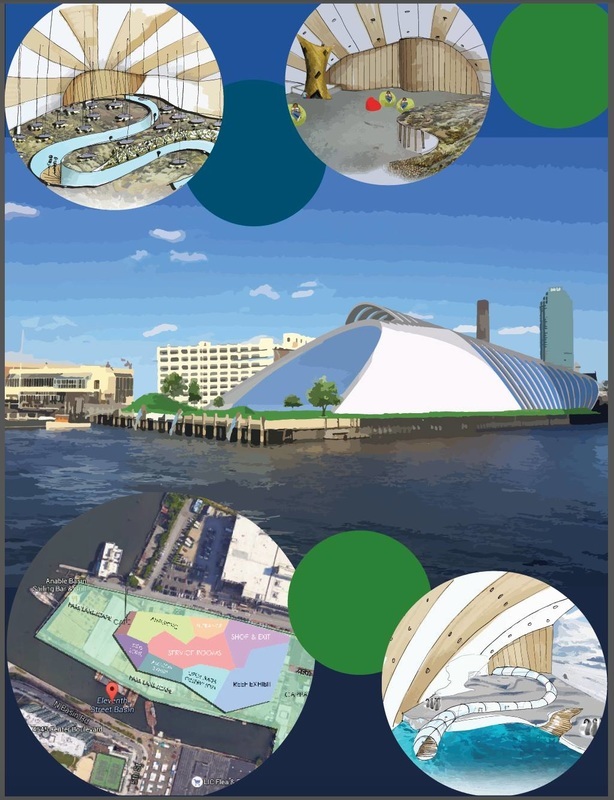 Ripple Aquarium Queens expresses the most vital and invaluable aspects of what makes this region so vibrant. The melting pot of cultures that have taken hold and shaped this city we hoped to personify in the four exhibitions displaying life from all over the world. The rippling skeletal exterior mimics Queens itself; its ever changing outline conveying the ever changing cultural outlook of the city, depending on what perspective you are looking from. We wish for the aquarium to be not only a tourist destination but also a hub of the community for everyone to enjoy. Two landscapes appears in front of people coming to the area: on one side Manhattan, on the other side a system of lanterns, a new way to enjoy an aquarium: L.A.N.T.E.R.N.A. is a life and light experience! 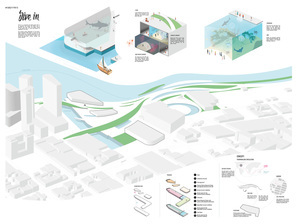 The aquarium becomes a new landscape for people, even if they won’t enter it. They are invited to have a walk along multi-layered paths in between the tanks which are linked with the surrounding environment and the urban context: while walking outside you are able to glimpse the inside whereas from the interior you can appreciate the park, the waterfront , the skyline. 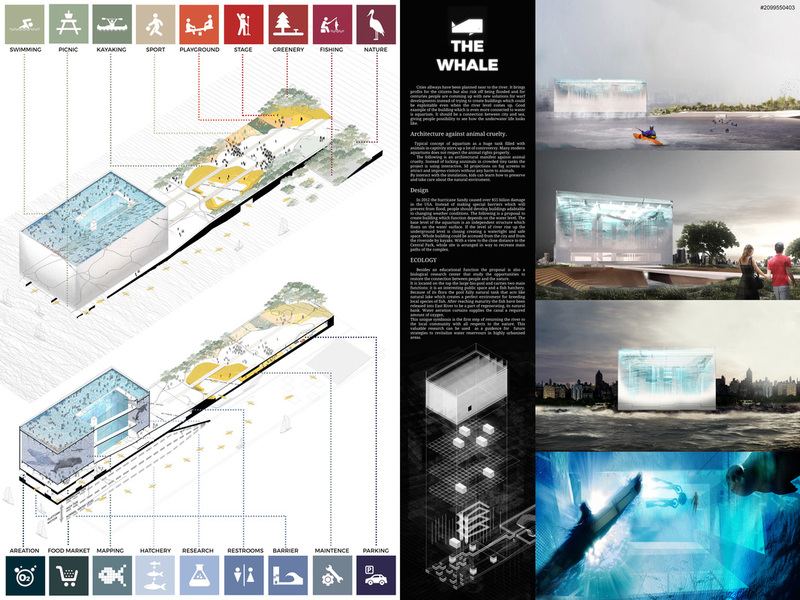 This design aims to incite an awareness about and provoke reactions to climate change and pollution. 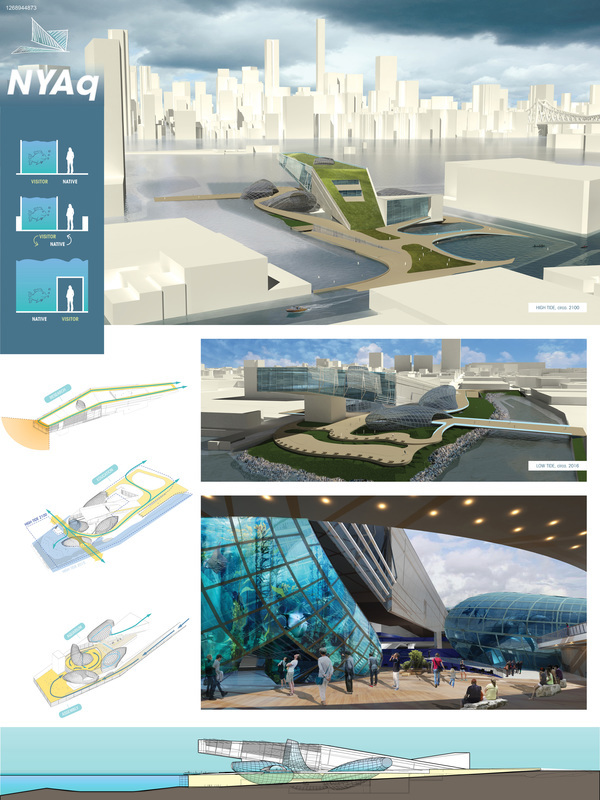 This is achieved not only through the actual content of the aquarium which will focus on contemporary issues surrounding water and aquatic life, but also through the architecture itself, by presenting an industrial and unrefined atmosphere. In regards to materiality, concrete, glass, and steel were chosen to echo industry and manufacturing. The aquariums are organized along a ribbon with human environments (programs) slotted recurrently. Scientists have divided the ocean into five main layers. These layers, known as "zones", extend from the surface to the most extreme depths where light can no longer penetrate. The proposed design offers users to be able to explore these augmented zones horizontally through a series of live exhibits carefully placed within the site. These exhibits anchor the urban public space above, which include gentle undulating topography. Creating an intersection between public and private, here public visitors will be able to get a glimpse of the live exhibits from the top, through hills that intersect with live exhibits. 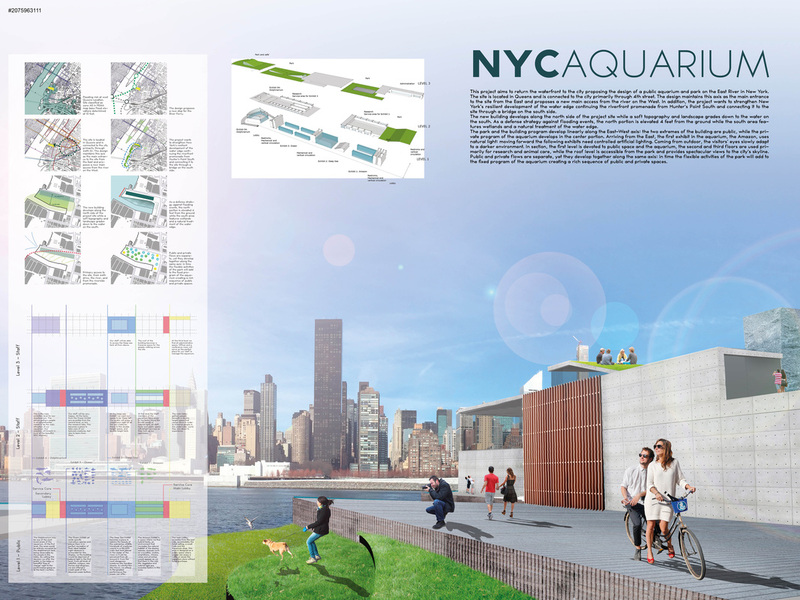 New York City Aquarium creates an alternative experience differing from typical public aquariums. While existing aquariums are situated as buildings with water tanks inserted into the program, this approach is essentially program inserted into a water tank. In order to populate aquariums, fish are removed from their natural habitat and relocated to confined spaces. Realizing the cruelty of captivation, this project gives marine life a proper habitat while maintaining an invitation for people to view into their world. 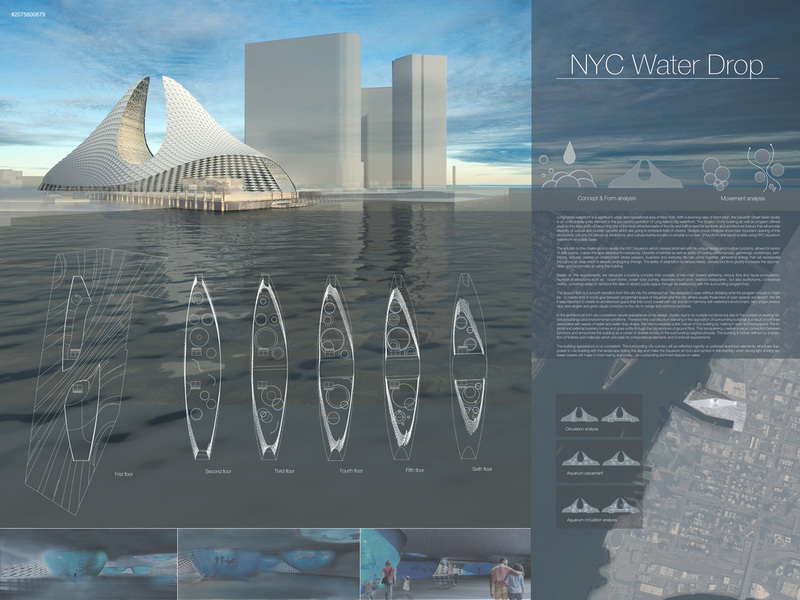 The water is designed to be ambiguous in scale. 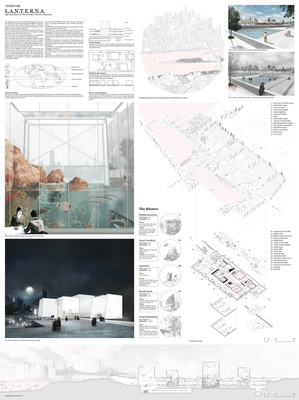 Regardless of the visitor’s location within the program they are completely surrounded by water. 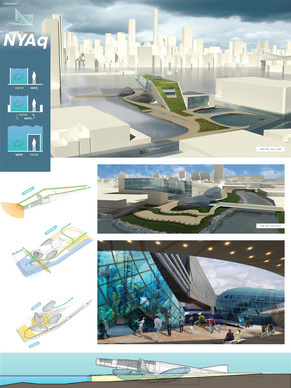 The AARC is the exemplary outcome of a “needs based design” approach, wherein a community analysis led to the creation of an aquarium that combines exquisite architecture with practical functionality. 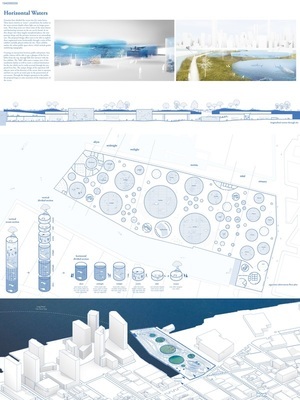 ​Like a wave crashing into a pier, the building is wrapped with a transparent membrane created out of recycled plastic bottles, and the public realm is an eclectic space featuring a mix of hard and soft landscaped surfaces that incorporate the existing smokestack. 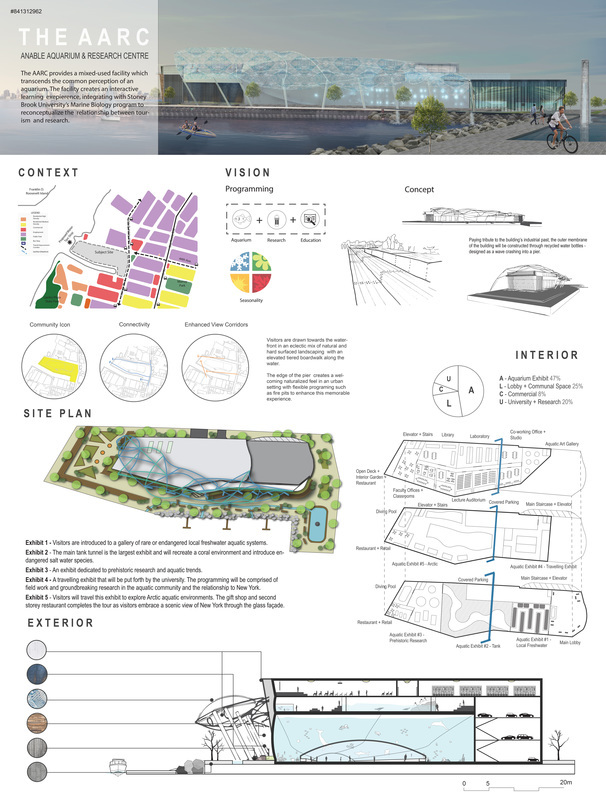 The AARC’s programing re-conceptualizes that relationship between tourism + research + education; including a state-of-the-art aquatic facility, university campus, diving training pool and community working/artistic space. experience, education and interaction. 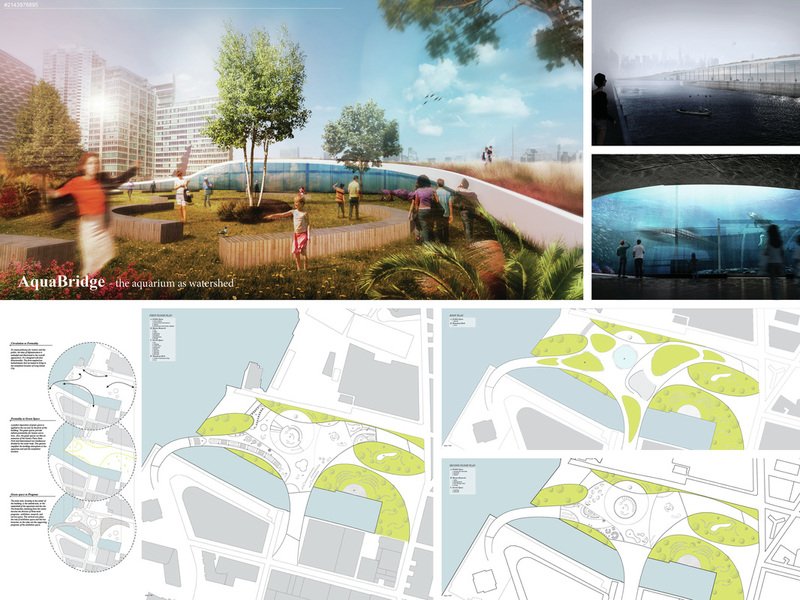 The aquarium and public park marry together in a way that seamlessly melds aesthetic with function, together forming a unique adventure. 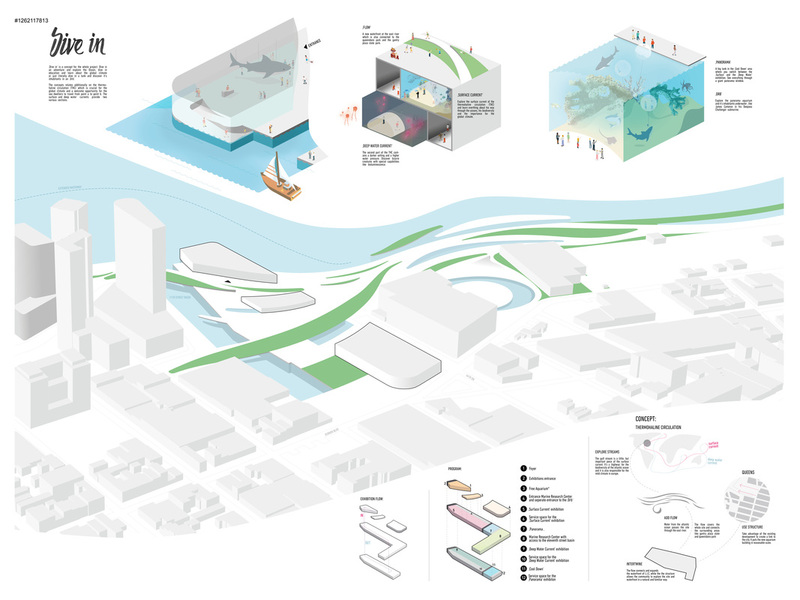 This design has a strong focus on interpreting how the aquarium can be partnered with the land that surrounds it and how a dialogue between the two can be formed.